It's safe to say that Poloz and the Bank of Canada weren't forewarned on the November jobs report. Poloz sent USD/CAD to 17-month highs with a dovish BOC statement that he confirmed in a press conference yesterday, essentially saying that the BOC was headed to the sidelines. Skip ahead a day and the combination of a 5% rally in oil and the strongest month of job gains ever for the Canadian economy has led to a reversal. Here's how it looks on the chart. What's disappointing is that even with a massive dose of goods news for the loonie today, the chart doesn't show much to be excited about. 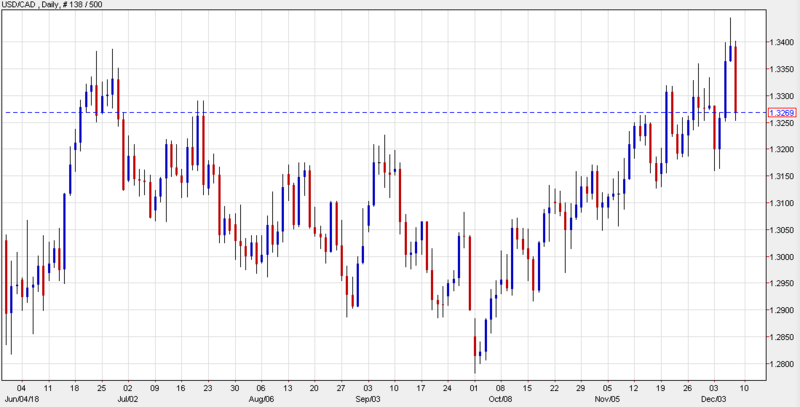 Maybe there's a three-candle reversal there but it would be a lot more impressive if we could close below 1.3250. Even on a close below, you need to get USD/CAD down another 100 pips to below 1.3150 to really break the beautiful uptrend since October 1.